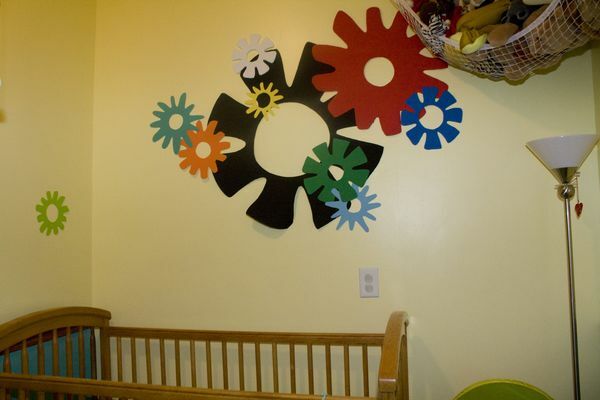 When decorating Eli's nursery, I was looking for something to put over his crib that fit my robot theme. I was really hoping to find some gears. I did find some vinyl ones on ebay, but they were pricey and pretty limited in size and color. So I decided to make my own out of fun foam! 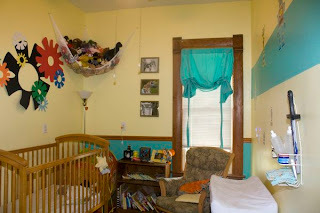 Here is Eli's room before he was born. The robots are re-positional stickers I found on amazon. 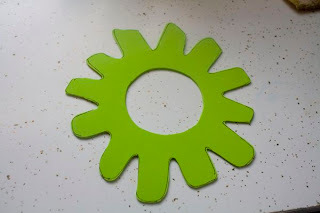 And the gears are fun foam wall stickers I made. 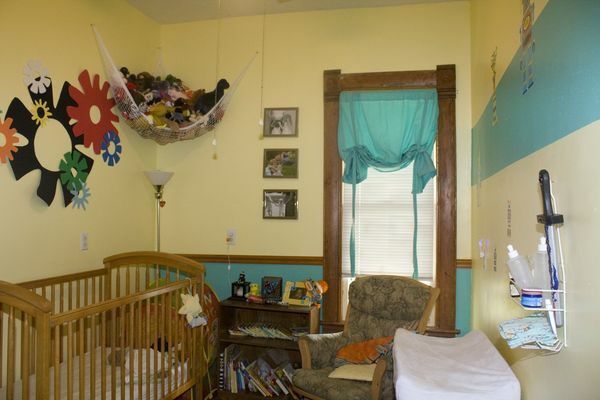 Now, we have had to add a pet net in the far corner above the lamp, so we can control the over abundance of stuffed animals that we have. While putting it up, Nathan knocked down one of the gears. No problem, with the way it was adhered it was easy to repair. Of course I had to find a new place for it because of the pet net. I decided to place it on another small wall with nothing on it just out of Eli's reach. Luckily if Eli does get a hold of it, it is very light weight! If you want to make your own fun foam wall decorations you have to first start by cutting out your shape. I used a flash light with a picture of a gear taped to it as a projector to trace my gears on my fun foam. Of course you can use a real projector or free hand it. Then cut it out. My shape (you can see the marks where I drew it, so this is the back). Lay down newspaper or trash bags and spray the back of your shape with spray adhesive. 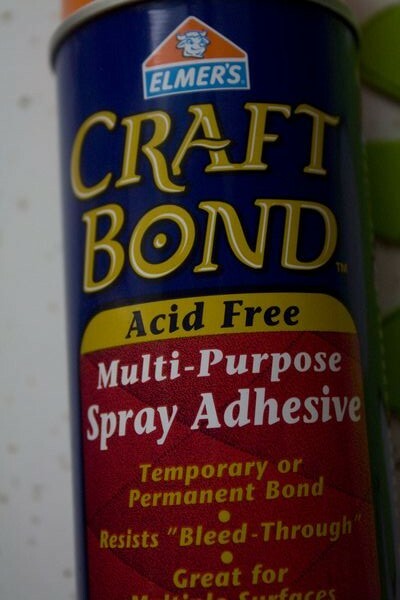 I used Elmer's brand, but I would guess most spray adhesives have a temporary bond option. That is what you want to use. For the Elmer's brand you let it sit for 3-5 minutes before applying it if you wanted a temporary bond. Adhere to your surface by firmly pressing all over the shape. My little gear in its new place. If you want to remove it simple lift up a corner and pull. It comes off cleanly. I did practice in the girls closet a couple times to make sure I was letting it sit long enough before adhering it because if it doesn't sit, it doesn't come off well! So here is the new room; not much has changed. Bria did inform me that she didn't like the gears overlapping because it looked like they were attacking each other. 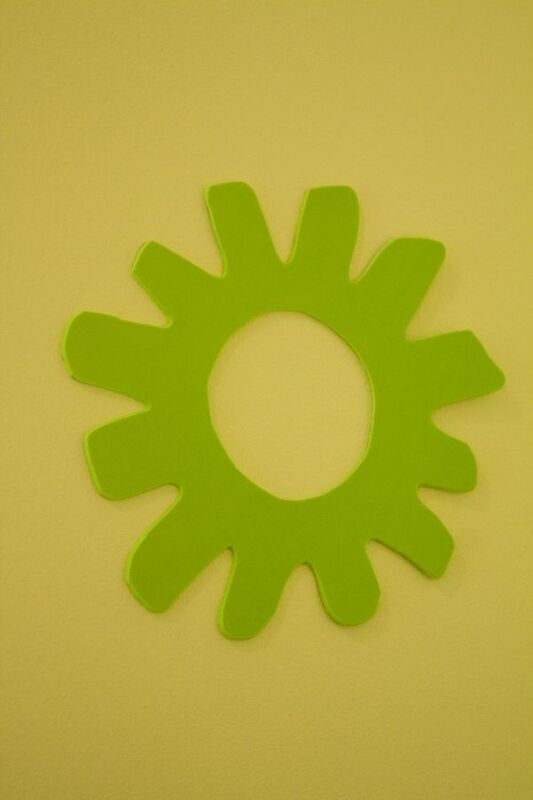 The green gear used to be above the red one. Now it has its own little wall where Eli can see it easier.